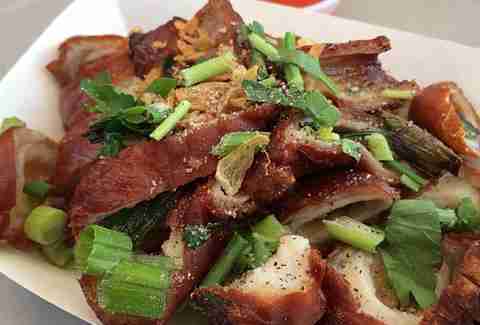 Do you like pork belly? Yeah, you do. Do you like tenderloin? Uh-huh. Do you like bacon? Yesssssss. Do you notice a trend???? Whoa, dude. You totally love all things pig. 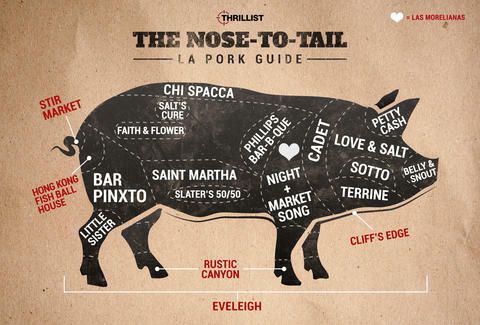 Which means you're totally TOTALLY gonna love this: the ultimate guide to eating pig in LA, complete with where to get the best dish made with every cut of pork. 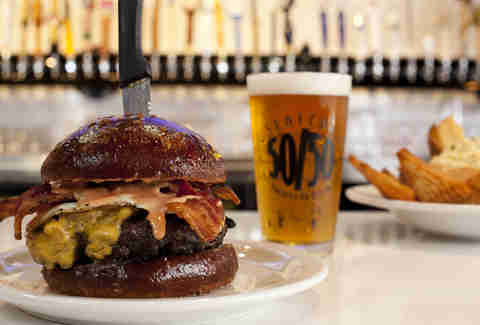 Slater’s 50/50 takes the bacon-wrapped-crown with the B' B' B' Burger: a half-bacon/half-beef patty, bacon (obvi), bacon American cheese, sunny side-up bacon egg, and Bacon Island dressing. With bacon ketchup. Yes, seriously. Yo, this is essentially whipped pork butter served with amazing bread. Yo. 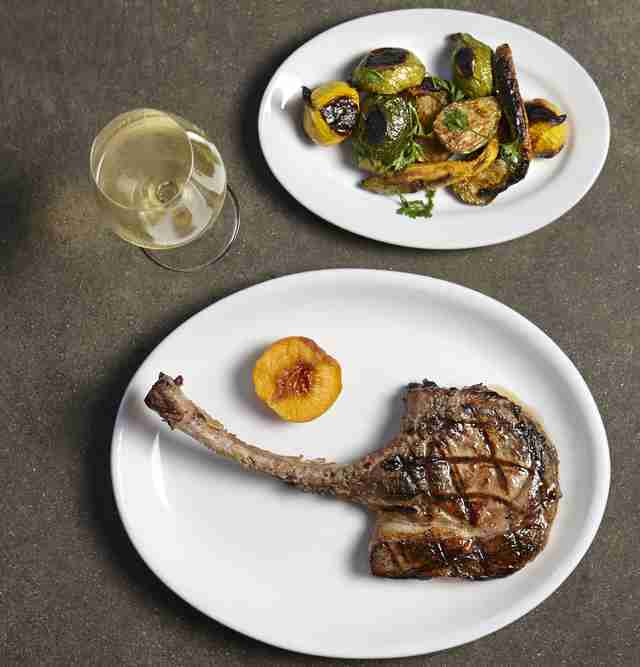 This WeHo outfit sources sustainably and butchers its own piggly-wigglies, so when that grilled, thick-cut, bone-in, sweet-onion-jus-laced chop hits your plate, it’s been treated with the utmost care. And it tastes that way, too. You already know that you’re getting the rib tips and sausages at this legendary Leimert Park BBQ joint. Now you know you’re getting the oak-smoked ribs, too. This Abita amber beer-braised pork belly with black garlic porridge and “almost 5 minute” egg stands, uh, bellies above tons of other pork belly preparations in town. 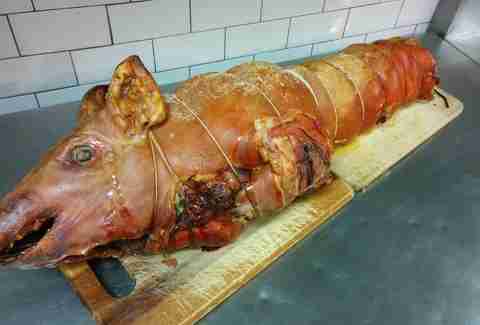 We get it, choosing your favorite part of the pig’s head is tough. Fortunately, at this MB date spot you can order the whole damn thing, roasted and glazed with maple-vinegar-pale-ale, and served with toast and condiments. 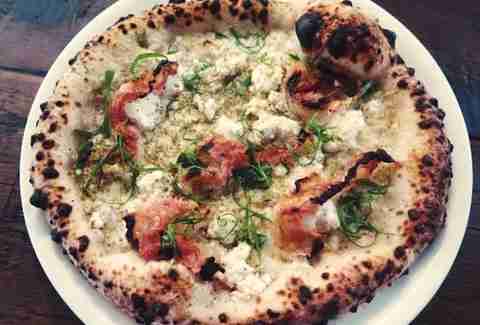 This is nothing like that Hawaiian pizza you insist on ordering from Big Mama’s & Papa’s for some dumb reason: this is some next-level pizza, and you need to get on this level -- with house-cured pork cheek, ricotta, scallions, and fennel pollen, this is part of the reason this underground spot made our list of the best Italian restaurants in LA. It’s pretty clear what this new Filipino joint in K-town has in store for you. The sisig hot dog is topped with a blend of -- you guessed it -- pork snout and belly, fried and chopped, and topped with chicharrón (porky bonus!). Be brave. It’s worth it. Not surprisingly (given the name), this new joint on Beverly really delivers on its swine-friendly charcuterie spread, including a house-made pork head cheese. 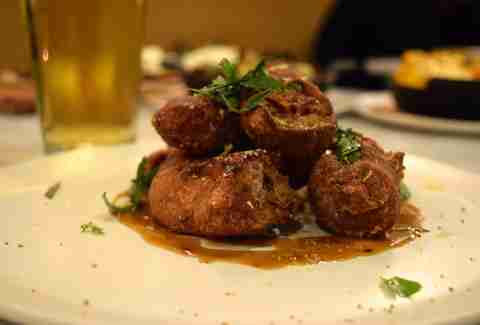 Don’t miss the crunchy-tender combo of sous vide and flash-fried pork jowls. 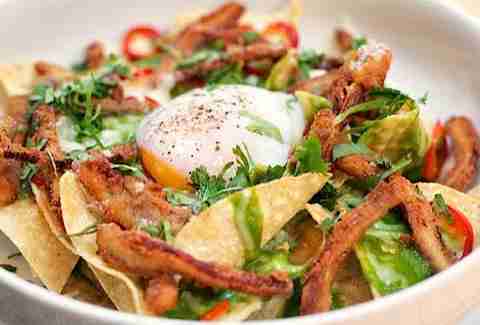 Pig ears may just be the new kale of food trends (fingers crossed!) with everyone from Animal to The Church Key to Barlo Kitchen + Cocktails dishing up awesome versions. 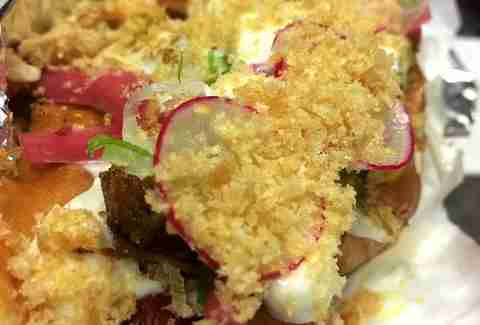 But it’s pretty hard to say no to these epic, crispy, nacho-fied ones, especially when they’re topped with a runny egg. Tip: don’t say no. This killer new modern/rustic French spot in SM is where you’re totally going to impress your date. And also where you’re totally going to order a wood-grilled pork collar, pork toro (aka the neck), and milk-braised loin. Lauded Chef Kris Yenbamroong's fatty pork shoulder is drowned in condensed milk & fresh turmeric overnight and then grilled to perfection -- and if you're feeling ultra-swine-y, add to your order with their Luu Suk pork blood soup. This Downtown food & cocktail mecca is pretty much on point at all times. 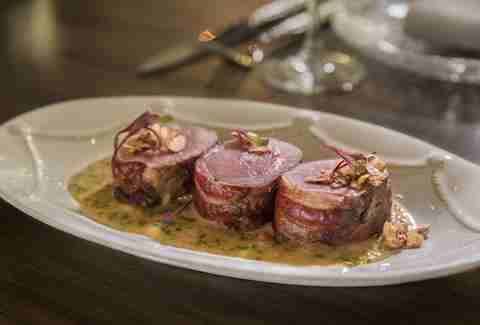 So, it’s no surprise that the bacon-wrapped (!) pork tenderloin delivers big. What you’re getting: Jamón ibérico "bellota"
Considered by many to be the holy grail of ham, the bellota version of this Spanish favorite is cured for 36 months, and that’s only after the pig that it belonged to leisurely feasted on acorns in a field. If they have a leg in house (it sells out fast), several slices will likely be all that you need (and can afford). Combining Euro styles and Southeast Asian spices, this MB staple turns out some serious shanks -- all of which are caramelized, red vinegar glazed, and peanut-scallion topped with a persimmon side. Forget about that jar of pickled pigs feet you’re now picturing in your mind. 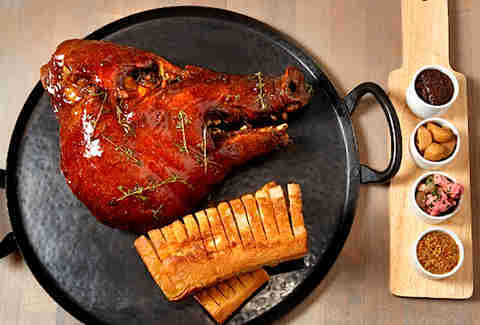 Now picture a fried puck of pork served with fresh citrus and fennel atop a mincemeat Dijonnaise. Yes... that's better. 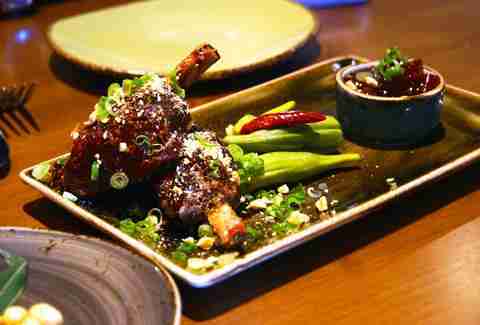 The new Jet Tila-helmed marketplace/restaurant's pig tail is crisp, chewy, and accented by fennel pollen, lemon zest, and herbs. This crackly crunch skin comes alongside pork belly, both topped with sumac, Aleppo pepper, jalapeño, and avocado. You've made it this far, might as well go all the way to the, uh, end. Yum? Heart, tongue, kidney, and more! When you’re looking for all that inside-porcine-goodness that you can’t find elsewhere, head to this Grand Central Market stalwart for the works. Traditionally from Michoacán, Mexico, the surtida is a crazy, flavor-packed pork party of heart, tongue, kidney, liver, neck, skin, leg, snout, ears, and feet. When you’re looking to go, ahem, whole hog, reserve ahead of time, get some friends together, and go nuts on an entire in-house-butchered Beeler’s Duroc hog that’s served with maple brandy baked Sierra apples, horseradish, house mustard, and fresh garden herbs. Danny Jensen is a regular Thrillist contributor and he ate a LOT of pig to make this thing happen. Thank him on Twitter and Instagram.